I love you so much you make me drool. Fuhgeddaboudit. 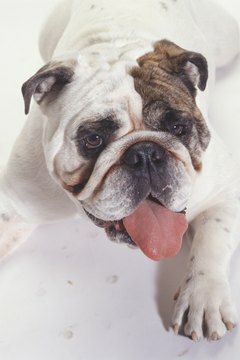 Bulldogs don't drool because they want to -- they can't help it. It's in their genes and in their bone structure. Once you've been to the vet and are sure the drooling isn't excessive (for a bulldog) or due to a medical condition, you just gotta deal with it. Understand that drooling is normal for certain breeds of dogs, among them bulldogs of every type -- English, French, American, Australian and others. It seems to occur more often in the large and giant breeds, such as boxers, mastiffs, Saint Bernards and Newfoundlands, but can show up in medium-size dogs (bassets, bloodhounds and Clumber spaniels) and small ones (pugs and Bostons). It's a function of head shape and mouth and lip formation. Study your bulldog's head. His skull is very wide and short from front to back, with a smashed-flat face and lots of wrinkles. According to the AKC breed standard, the muzzle is very short and upturned and the upper lips must hang over the lower jaw on each side. This configuration makes it almost impossible for the bulldog not to drool, but if he didn't have it, he wouldn't be a bulldog. Look at they way his lips meet -- or don't meet. When the upper lips (or flews) are large and fleshy, they can't close tightly and form a seal to keep saliva inside the bulldog's mouth. All dogs salivate when the dinner bell rings, or so Dr. Pavlov tells us, and when they get excited. Some slobber a lot, some slobber only a little. They also have to drink water from time to time, and then the bulldog has the same problem you do when the dentist loads you up with Novocaine and you no longer have control of your lower lip. Give your bully boy chew toys to soak up some of the drool and get him to swallow more often. Keep lots of towels in strategic locations, and that means anywhere the dog goes, especially in the car. Hand them to friends as they enter and keep one more or less permanently over your shoulder. As you wipe down the walls, the floor, the furniture and your face for the millionth time, think of it as liquid love. Keep your bulldog as cool as possible in hot weather. He has trouble with air exchange anyway, and panting is not only not very effective, it also makes him drool more. Bulldogs World: Does Your Bulldog Drool? About Small Dog Breeds: Brachycephalic Dog Breeds -- Real Hot Dogs! Pet Search Party: Adopt a Saint Bernard in your area and save a life! Sarah's Dogs: What are some causes for a dog to drool?